A couple of years ago a young Peterborough lad called Harry Murphy started to make his mark in the world of angling and at the time I said he would be one to watch. Well, it seems I was right. 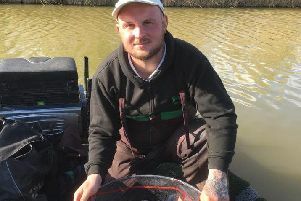 This season he has blossomed into a fine match angler and can now hold his own against some of the area’s most experienced matchmen. He has a natural ability and is not afraid to ask questions when he doesn’t get it quite right and at the moment his tactics at several local venues have been spot on. His latest victory came in the Saturday open match at Float Fish Farm, where the matches have grown in size over the past few weeks and attract good quality fields. With lots of pegs taken and all but a full lake it was never going to be a big-weight match but young Murphy made the most of a good draw on peg nine despite a very poor start to the day. A small feeder did pick up a few fish over to the island but it was a switch to a pellet waggler that did the business and at the whistle Murphy had put a very respectable 75lb 6oz to the scales. Runner-up was Alan Marshall with 65lb 4oz followed by Peter Carter on 55lb 10oz. At the moment Peter Telszewski can’t put a foot wrong. On Sunday he put a huge 156lb 2oz net of carp to the scales to take top spot in the Webb’s AC match at Buttonhole Fishery out at Wisbech. He caught most of his fish on the pole from the margins on sweetcorn and pellet, netting fish into double figures. He didn’t have it all his own way though as John Woods came a close second putting 147lb 1oz to the scales followed by Ray Gregory on 122lb 14oz and Martin Harwood with 122lb 12oz. JVAC fished the Yew Pool at Decoy Lakes, a venue noted for its big carp these days and they showed up at a number of pegs. Top rod was Dave Corcoran. He drew peg 14 and after a very slow start to the day found fish late on in the margin on pellet and corn to finish with 115lb 4oz. Terry Tribe fished a small feeder on peg 30 and finished second with 103lb 8oz, then came Roger Gowler fishing the pole with pellet for 99lb 7oz. The regular Over 55s match at Decoy Lakes saw a good turnout fishing the in form Beastie Lake. It did not disappoint either as there were lots of three-figure weights topped by Chris Saunders. He drew peg 30 and put 160lb 7oz to the scales - all taken on a short pole line with cat meat. The big weights all came from the high numbers and second from peg 29 fishing similar tactics to the winner was Roy Whincup with 150lb 9oz. Then came Gus Gausden with 147lb 7oz.